This is from a story from the The Detroit News website. Detroit is usually the purview of my dear friend, Michelle Brooks. Still, I couldn’t let this one go by. The story is horrifying enough, but the picture speaks volumes. “Yeah, he’s been down there since last month at least.” Kenneth Williams, 47. His name is Johnnie Redding. Brooks is not a good example of Detroit attitude, she still cares. http://www.freep.com and look at the comments following any article with the word “Detroit” in it. Of course I should have mentioned that the man’s name was Johnnie Redding, Mark. Thank you. And you know she’ll always care–that’s just the sweet way Michelle is. Laura I wasn’t being critical of you in not mentioning his name, I had just found out who he was. I will admit, more so than most death around here Mr. Redding’s disturbed me more than I care to admit. Not so much that he’d died, he sleeps well and comfortably with his ancestors now. (our homeless freeze with regularity here) But the blase attitude surrounding it was even more “Detroit” than usual. I am disgusted with the people of this place and no longer think of it as home…took 54 years of living south of 8 but this one finally tipped me over the edge, I now only acknowledge my UFO heritage. This is a really sad story. I know there are people (like Mark!) who still care — it’s just such a tough time right now, tough town in general, and the picture is truly haunting in the way good fiction is — makes you think about things hard and feel things you do and don’t want to feel. I’m glad you posted this one – I think people ought to take notice. It will take a long time for me to get over that picture. Of course, there are homeless people everywhere, not just Detroit (some of the newspaper’s comments seemed to trash Detroit and the people there.) It’s a national problem. 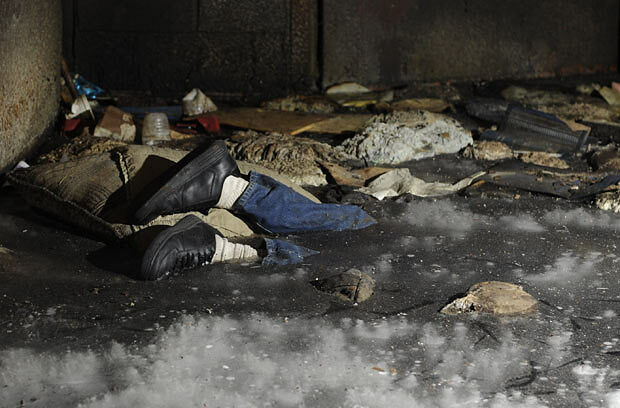 Every winter in NYC we hear stories of some poor soul who dies from exposure overnight, or who is sleeping over a subway grate to stay warm. On really cold nights, there are vans that travel around the city and distribute sandwiches and blankets and will give anyone a lift to a shelter, but some won’t go because they’re afraid of being robbed. It’s an awful situation.